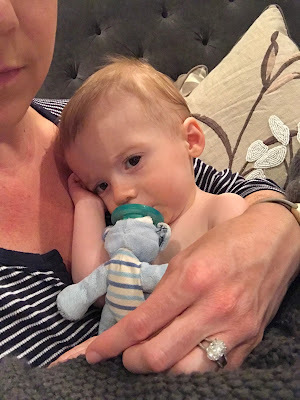 KARA'S STORIES: Stomach Virus Part 5. Well. What a weekend we had. Bennett and I got hit with our 5th stomach virus in 5 weeks. Every Friday we have woken up sick. This case was by far our worst. I was absolutely miserable but I think Bennett felt worse than I did. I was completely useless and spent a majority of the day laying on the tile floor in my bathroom. I knew Bennett was really sick but I didn't know much. Scott would bring him to me so I could nurse him then Scott would take him away. My parents just so happened to be up for the weekend because they had to do some work up here on Saturday and you can't even begin to comprehend how thankful I was to have them here so they could help us. I woke up feeling about 50% better on Saturday but poor Bennett was still unable to keep anything down. We talked about taking him to the hospital but honestly, we knew there was really nothing they would be able to do for him. By the afternoon he was able to keep some milk down so that was some good progress and he had a few wet diapers so I felt comfortable keeping him home. I really wanted to be able to see how many ounces of milk he was getting and even though he has flat out refused bottles for the last two months, I decided to give a bottle a try. He took it without any hesitation (and kept it down) and I was so, so, so thankful. I gave him another bottle a few hours later and he took it again. I could tell just by looking at him that he was getting smaller and smaller. I didn't give him his bath on Friday night since I was so sick. When I got him in the bath on Saturday and saw how tiny his little body was, it made my stomach sink. I couldn't believe how much smaller he looked since I had given him his bath just 2 nights before. He seemed a little better on Sunday and kept everything down but I noticed that his diaper had suddenly gotten too big for him and he was leaking out of it. I was anxious to get him in with our doctor today just to make sure everything with him was okay. 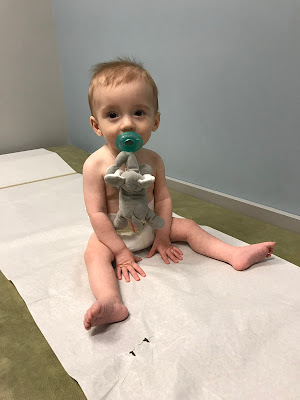 I made an appointment first thing this morning and when they weighed Bennett, the scale showed he had lost over one pound since his last appointment on the 9th. Honestly, by the way he looks I was expecting it to be more so I was actually somewhat relieved. The doctor checked him out really good and everything looked and sounded great. He's just extremely dehydrated. The doctor wants me to add in some extra nursing sessions to try to get his weight up and I've decided to just give him a bottle since I have so much frozen milk and I can see how much extra he's getting. We're going back on Wednesday to see what the scale says and I'm sure that won't be our final visit. I predict many weight checks in our future. Bennett is doing so much better today and we even got some smiles and a few giggles out of him. My heart breaks for him because I can tell he's still not 100% and he just seems really weak. He also has required being held every moment of his waking hours.....not that I can blame him. Bennett has still slept great at night and taken really good naps and I'm so thankful because we all know rest when we're sick makes us heal and feel so much better. He did wake up at 5:00 on Sunday and 6:00 today but I just fed him then put him back in his crib and he quickly fell back to sleep. I'm glad Bennett his gotten his rest but I most definitely have not. I've been so wired the last few nights due to anxiety. I've gone in his room to check and recheck and just stared at the monitor all night long. Talk about stress on this momma. We have had so many people reach out to us to let us know they're thinking about Bennett and have been praying for him and it has truly just touched my heart so much. Scott and I were just talking earlier and saying how nice and kind and thoughtful everyone has been. To have people say they have prayed for our sweet Bennett is such a gift and appreciated in such a big, big way. I firmly believe in the power of prayer and I know that the Lord heard all of these prayers for Bennett and has begun to heal our sweet baby. I hope our weight gain journey won't take us too long and I pray so hard that we won't get hit with this stomach virus again. It has. It seems like everyone is sick. So ready for warm weather and no more sickness!!! !